The mission of the Australian Institute of Building is to support members and advance the building and construction industry. Following World War II the building industry was confronted with a huge programme of civil and commercial building. This called for improved productivity, more intelligent use of resources available and the development of new techniques and new material. Leaders of the industry appreciated that building was developing from empirical craft processes to a technological discipline spanning physical sciences and involving construction techniques which were unknown in the early part of the 20th Century. Development in the science of environment and building services had also added a new dimension to building technology. As building involved investment of public and private capital to a greater extent than any other commodity, rational, economic and efficient working was essential. Skill in the management of building work is as important as the technology itself. A trend to higher educational standards and a more positive approach to training executive and technical staff of Building organisations was clearly required. The effect of this impact on the building industry was to highlight the need for a professional body to promote efficiency and establish a high standard of technological education for those engaged on the construction side of the industry. A ‘Committee of Investigation’ was set up in 1947 by a convention called by the then Master Builders’ Federation of Australia (MBFA) which, although firmly established since 1890, was not acceptable as a professional body because it was an employers’ organisation. There was agreement that an Institute should be constituted on professional lines to represent the construction side of the building industry, and both the Royal Australian Institute of Architects (RAIA) and the Institution of Engineers Australia (IEAust) agreed to assist in selecting the foundation membership. The Australian Institute of Builders was established in 1951 with a foundation membership determined by a selection committee in each state, comprising two representatives of the RAIA, one representative of the IEAust and two representatives of the MBFA. The Foundation Members also included members of the Building Diplomats Association of NSW, associated with the Sydney Technical College. In 23 November 1951 the Foundation Dinner was held in Sydney and the then Mr Robert Menzies, Prime Minister of Australia, was presented with a Certificate of Honorary Membership. The Institute was incorporated on 15 November 1955, granted Armorial Bearings on 20 August 1960 and incorporated by Royal Charter on 7 October 1969, despite the protests of the CIOB(UK). It had, on 26 May 1967, changed its name to The Australian Institute of Building (AIB). Having established itself and received recognition accorded by a Royal Charter, the Institute began to redefine its educational requirements at Licentiate and Corporate grade. It then set about ensuring that the then degree and certificate courses in building which were available met the standards which the Institute required. From this has developed a course assessment/qualification accreditation system which has proven to be of great value to academic institutions and the industry. While graduates in building were recognised immediately by the private sector, recognition in the public sector was harder to achieve. The breakthrough came in 1977 with the recognition by the Public Service Board of Degrees in Building for the positions of Project Manager Class 1-3, Area Manager Class 1-3 and Construction Manager. Recognition of the AIB as a professional institute was accorded in the Commonwealth Gazette in March 1983. This approval, under the Industrial Research and Development Incentives Act, recognises Corporate members of the Institute as professionally qualified. Since its establishment in 1968 the Australian Institute of Building Research and Education Foundation has funded developments in education and specific research projects. One of these projects determined the duties and responsibilities of, and the levels of competence required by, professionals and technicians in the Building industry. In 1990 the AIB became an Associate of the International Council for Building Research (CIB). The AIB Papers, a journal of refereed academic papers, has been published by the Institute since 1986. The By-laws and Regulations were amended to allow for changes to grades of member in 1981, 1992 and 1997. With the Foundation of a New Zealand Institute of Building (NZIOB) in 1984, the New Zealand Chapter of the AIB was closed down. The AIB continues to have a close relationship with NZIOB. In 1997 the AIB became a foundation member of the International Association for the Professional Management of Construction (IAPMC). So as to streamline management decisions, in 1996 the Council delegated most of its authority to an Executive Board of Management. Pending development of industry wide competency based standards, the Institute produced standards for its own membership purposes. These standards are also used for assessing applicants for the National Building Professionals Register (NBPR) which the AIB launched in 1997. A Hong Kong Chapter and Singapore Chapter were established in 1998, and AIB’s overseas operations expanded considerably ten years later. 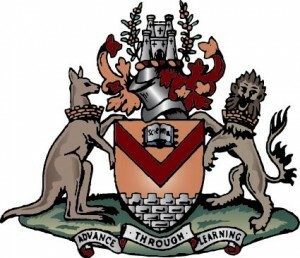 The Australian Institute of Building (AIB) was granted Armorial Bearings by the Garter King of Arms on 20 August 1960, with approval for the use of supporters to the Arms, a feature reserved for scholastic bodies of good repute and Governments, such as in the Australian Government’s Coat of Arms. The kangaroo and lion supporting the shield symbolise the relationship that AIB enjoys with within the building profession in Australia and throughout the Commonwealth. The motto Advance Through Learning that appears on the Institutes Coat of Arms continues to be used by the Institute. Such archaic relics of a chivalrous era are little valued in modern Australia however they continue to serve as an important reminder of the historic legacy that the Institutes current Council, members and staff are responsible for protecting. Surprisingly few organisations or people who use a coat of arms and crest today have any actual right to do so. Rights to a Coat of Arms are made by the appropriate heraldic authority acting under the sovereign. These authorities are the College of Arms (in England, Wales and Northern Island), the Lyon Office (in Scotland) and Chief Herald of Ireland (In the Republic of Ireland). 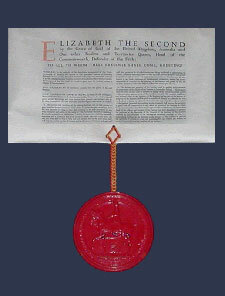 Royal Charters, granted by the sovereign on the advice of the Privy Council, have a history dating back to the 13th century. Their original purpose was to create public or private corporations (including towns and cities), and to define their privileges and purpose. Royal Charters were at one time the only means of incorporating a body, but there are now other means (the formation of a Pty Ltd company for example), so the grant of new Charters is comparatively rare. For the past 150 years new grants of Royal Charters are reserved for eminent professional bodies, such as AIB, or charities which have a solid record of achievement and are financially sound. In the case of professional bodies they should represent a field of activity which is unique and not covered by other professional bodies. At a meeting of the Privy Council at Arundel Park on 31 July 1969 , Her Majesty the Queen approved granting of a Charter. AIB was incorporated as a ‘body corporate and politic’ by Royal Charter on 7 October 1969. When the Royal Charter was granted letters of congratulation were received from the former Prime Minister Sir Robert Menzies, the serving Prime Ministers of Australia and New Zealand, all State Premiers, and most of the related professional associations in Australia and overseas. Prince Philip, Duke of Edinburgh, an Honorary Fellow of AIB, sent a congratulatory telegram. AIB was a proud recipient and it was regarded as a collective honour for all the members. One of the privileges provided by the Charter is the right for all corporate members to use the title of Chartered Builder. Australians were the first builders in the world to gain this title. 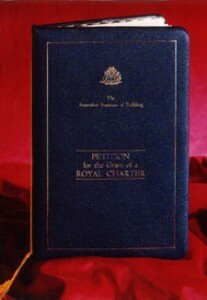 The AIB Royal Charter can be viewed at the national office in Canberra, Australia. The 79th meeting of the AIB Council, they have been numbered consecutively in the minute books since the inception of the Institute in 1951 (the February 2008 meeting of the Council was the 216th meeting) took place in Adelaide on 19 September 1969 . This became the first meeting of the Council since incorporation by Royal Charter, and needed to deal with a multitude of housekeeping decisions to facilitate the transition to a new legal status including the transfer of all assets and liabilities. By mid-1970 Australia s Governor-General, the Rt. Hon. Sir Paul Hasluck GCMG GCVO KtStJ , as personal representative of the Queen approved by-laws under the Charter which were necessary to replace the Articles of Association of the former entity. The Governor-General presented the Letters Patent granting the Royal Charter to the AIB President, Alex Rigby, at a Commemorative Dinner held at Randwick Racecourse in Sydney on 1 June 1970. Amongst the 365 guests was a distinguished array of Federal and State Ministers, the Chief Justice of New South Wales, the Lord Mayor of Sydney and representatives from other professional institutes, universities and government departments. In making the presentation the Governor-General said it is a great tribute to the work of the Institute and the place it takes in the Australian community. Today the Royal Charter hangs in the entrance to the AIB national office and serves as a daily reminder to Councillors and staff of the legacy that they are entrusted with. The title of the position has varied but the essential role of the job remains as providing administrative leadership and legislative policy advice to the Council and Board.